by Dr. Patrick K. Freer, editor Piero Bonamico. Conductor, teacher and researcher Dr. Patrick K. Freer explores practical solutions to common problems while focusing on an impromptu ensemble of everyday kids. These three fast-paced DVDs demonstrate familiar challenges and Freer’s real-time solutions to them. You will see the process unfold as it actually happened, and see how Dr. Freer incorporates research on adolescent learning into the process of teaching choral music. When working with these young adolescents, Patrick Freer demonstrates clearly how challenges associated with male and female changing voices can be handled successfully. Interviews with the students present a valuable perspective on being an adolescent singer, and a special segment of Video 3 is designed to be shown in classrooms and choirs. The included booklet contains additional materials with printed instructions for the exercises demonstrated throughout. 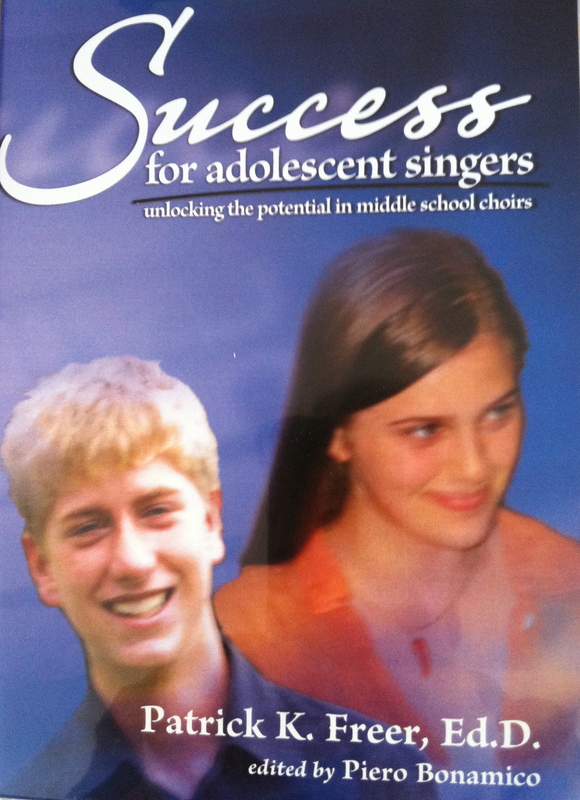 Many young adolescents simply stop singing during or after middle school. Middle school teachers and conductors of youth choirs need to ensure that their singers are motivated to continue choral singing for a lifetime. These videos outline a philosophy, grounded in research, which embraces the challenges of adolescence and matches them with solutions. These ideas, along with the accompanying methods and strategies, will enable you to promote success for your singers and provide greater fulfillment for yourself. Extra booklets are available in bundles of ten. The three DVDS are also available to libraries packed in three separate cases each with a booklet, at no additional cost. Regular shipping of website orders within the 48 contiguous United States is free. For shipping to Alaska and Hawaii, rush orders or overseas orders, call or email for shipping cost.